Featuring Pat Mastelotto,Tony Levin, Mike Keneally and more. Ronan Chris Murphy who many of you might know from his work as a producer, engineer and/or mixer for the likes of Steve Morse, Bozzio Levin Stevens, the CGT and over a dozen releases by King Crimson has started a new label focused on hard jazz, prog and experimental new music, or as Murphy describes it "High brow music with a punk rock spirit"
"Destroyng Silence: An introduction to Veneto West Records"
How to Destroy Silence: An interesting proposition by Ronan Chris Murphy, prestigious musician, and one of the better known producers and sonic manipulators in the world. An ambitious objective, if we consider that in silence there is the sense of things, nature, and ourselves, but Murphy knows what he is doing and organizes a beautiful CD compilation with the jewels from the Veneto West stable of artists. Veneto West is a brand new label founded by Ronan, inspired by labels such as ECM and distributed by Inner knot. With this compilation as the labels introduction to the world, this looks to be a very promising new label. Even with such an exceptional set of artists, it is more than the individual names on the album, it's the intoxicating atmosphere of the work. A mix of progressive, jazz rock, and sonic research, with a punk spirit and Zappa-esque philosophyÊcombined with skill and ability. This is the role of a good producer, to allow artistic freedom while pushing the creativity of every single artist to find that unique element, that unique beacon on the sea of international discography. 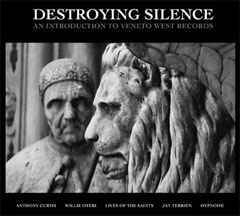 The artists included in "Destroying Silence" are an interesting calling card. Eccentric guitarist Anthony Curtis takes advantage of a collaboration with Tony Levin and Mike Keneally on three tracks of cool jazz-rock which is reminiscent of a more psychedelic free-form Crimson. Another great guitarist on Veneto WestÕs team is Willie Oteri: with the same band. (but with Pat Mastelotto on drums in place of Lewis Pragasam), creates rock-jazz from the bitter and rough tones, something like Miles-esque atmospheres to groovy Zeppelin sounds. Also fascinating is the "Live Of The Saints" project, with Murphy and Bill Forth on guitars, kind of an updated version of Fripp & Eno, an ambient music rich in surrealistic and grotesque textures. Jay Terrien is a curious bass player, who in trio with Mastelotto and Murphy gives us a techno-rock that is both audacious and futuristic, made of sonorous spider webs and endless loops. A great end to the album is one of Italy's most promising bands, Hypnoise: with their second album soon to be released on Veneto West Records, their psychedelic prog is ready to get new, musically adept, fans as testified by two intense and bold songs on "Destroying Silence." Veneto West is not only a label: it is an arena of artists, and area of exchange, and a crossroads of new languages. Welcome. From Angelo Giovanni of Rome, Italy on 2/24/2006 .